Alright, so this was my first time cooking with clams and mussels. Beer is classically used in Belgium to steam mussels, so being "the beer cook" I knew I eventually needed to make something with beer and shellfish. 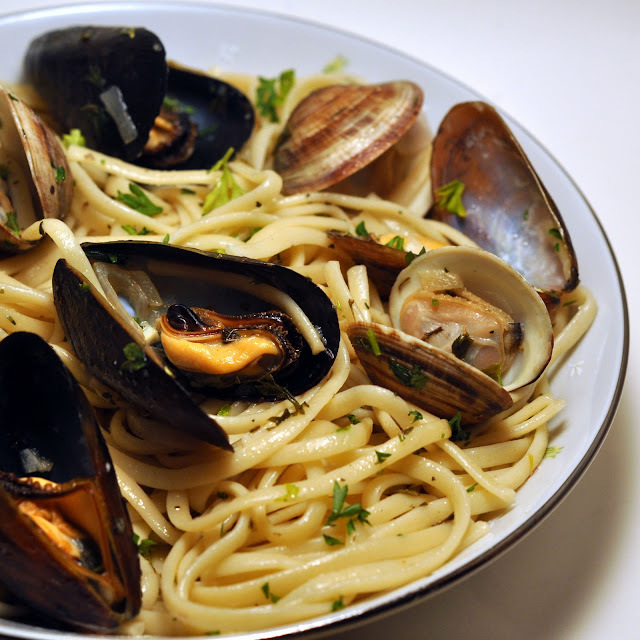 I originally wanted to make linguine with clams, and then decided to use both mussels and clams for my dish. It all turned out really yummy and I was pleasantly surprised by the price of the shellfish (especially the mussels!) and how easy they are to prepare. I can't wait to cook with this stuff again. I also decided to try out a new beer for this recipe. I wanted a Belgian Witbier to cook the shellfish with and saw Troublette at Whole Foods. It's from a brewery in Belgium called Brasserie Caracole (Caracole means snail. Look at the cute little snail on the bottle!) I had never had it before but saw online that it had some pretty great reviews so I grabbed it. I'm glad that I did because it ended up working beautifully. Rinse the shellfish and scrub off any sand. Debeard the mussels (This means removing the little seaweed-like stringy things coming out from between their shells). Make sure all the shellfish are closed tightly. If they are not, give them a little tap on a table. If they don't close up, discard them. Melt 1 tablespoon of butter in a large pan over medium high heat. Add the shallots and garlic and cook until softened. Add the beer, clam juice, and half of the parsley to the pan. Place the clams and mussels in the liquid and cover. Let them cook for about 5 to 8 minutes. Remove the opened shellfish and set aside. Discard any that didn't open. Add the butter, lemon juice, salt, and pepper to the liquid. Let this simmer for 5 minutes. Add the shellfish back in along with the cooked pasta. Add the olive oil and the rest of the parsley. Gently combine everything and enjoy with a glass of beer. It's also good with a bit of grated parmesan cheese.